Thank you guys for being so supportive during my transition to Abu Dhabi. A special thank you to those who composed guest posts to help me out. 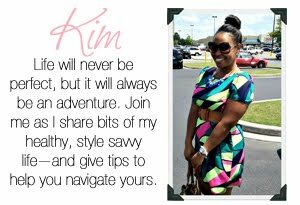 Today's guest post is from Kim J, editor-in-chief of Pish Posh Perfect . She is also my friend as well as former dorm mate at MSU. Thanks Kim. 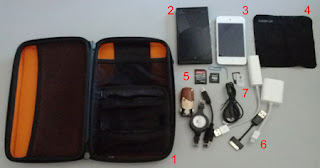 Check out Kim's post on being organized while packing. I certainly needed this. I was so honored when Reginia invited me to pen a guest post for her blog, as I have been admiring it ever since she and I reconnected a few months ago. She asked for organizational tips and, inspired by her current travels and a recent vacation I took, organization around packing seemed a natural fit. I strive to keep everything in my life well-organized, from schedules to home to office—and these are the things that help to keep me on track when I’m planning to go on a trip. Hopefully they’ll help you as well! I believe that with the right preparation travel can be infinitely less stressful, giving you more time to focus on the joys of the trip itself. So what does the well-organized girl do when preparing for a trip? Plan outfits ahead of time--even down to accessories and undergarments. Maintain a similar color scheme for as many of your outfits as possible. To the same end as planning your outfits ahead to avoid an over-packing situation, plan said styling within the same color scheme as much as possible. This allows you to wear the same shoes and accessories more than once, and leaves room in your suitcase for all the great purchased items you’ll want to bring home! Know what type of baggage you’ll need based on where you’re going and the length of time that you’ll be away. Is an overnight bag suitable? Would a duffle work better? 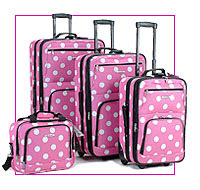 Is there a weight restriction for suitcases on the airline you’re flying? Be sure to take advantage of the extra space within your suitcase. Does it have compartments inside? Can you fit flat items like your magazines in the front pocket? 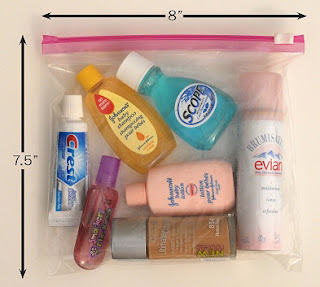 I also recommend the use of dedicated bags that go inside your main bag like: a cosmetics case for your hair and makeup products (so nothing spills on your precious cargo); shoe bags to protect their heels and fabrics; and folding jewelry travel bags—these often have specific, sized compartments for earrings, necklaces, etc. Keep travel size toiletries and plastic containers on hand. Because I travel often, I like to buy travel sized toiletries and keep them in my cosmetics bag so they're always there; as well as travel sized bottles and containers to use for my products-of-the-moment that don’t already come in smaller packaging. It’s great because in the proper sizes, the containers work for both road and air travel. Opening my bag and seeing the needed items already there greatly reduces the last minute stress of running around and trying to snag things. Clean your home before you leave. I always, always clean and straighten my home prior to going away—even if it’s overnight. I make sure beds are made, bathrooms are cleaned, dishes are washed and all trash bins are completely empty. I even make sure to get rid of any leftover items in the fridge (coming home to weird kitchen smells can’t ever be a good thing). After being away on a great trip or vacation, I want the peace of mind to extend even once I’ve returned home; and clutter immediately disrupts that. Having fresh scents permeate the rooms and crawling into fresh sheets makes the hard prep work all worth it. Scope out the travel landscape. If flying, be sure that you are checking the airline’s website for travel restrictions and flight schedules. If road-tripping, map out your route ahead of time—even if you use GPS, it’s great to have an idea of where you’re headed before hitting the open road, just in case. Be aware of any toll roads, and plan stops for bathroom and/or snacks if going on a particularly long trip. This way you have an accurate idea of what your trip will be like which will ultimately alleviate stress. What are some of the organizational tips and tricks you use when prepping for travel? I have never flown before but I need to know because one day I will take the plunge. The luggage though is ridiculous I pack a boat load for 3 days I can only imagine what I would have to pack for more than that. perfect post Im traveling this weekend and packed yesterday already but will keep this handy for the next time I have to pack!!! "I believe that with the right preparation travel can be infinitely less stressful, giving you more time to focus on the joys of the trip itself." There's definitely an art to it and the more you travel, the more you learn about what works best. You're getting a lot of practice this year, Kimmie! Love the tips, Kim! My favorite and the thing I always do before leaving on a trip is clean the house. When I come back from a vacation I just want to go straight to the sofa and just lounge and enjoy my home. You can't do that if it's in a rut! Music Review Monday - "Cooking with Carolyn"